An MTA New York City transit subway M train. Aug. 13, 2013. BUSHWICK — A series of buses will shuttle commuters around during the M train shutdown, according to the MTA's alternate service plans presented to residents Wednesday night. 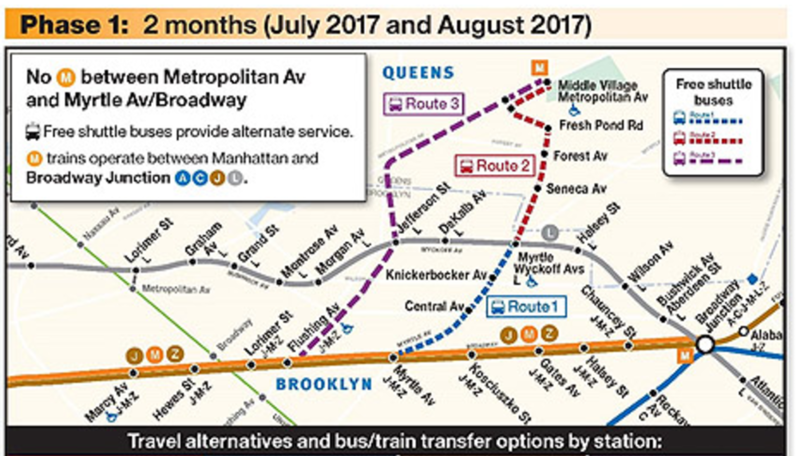 Starting this July, the M train won't run between the Myrtle-Broadway stop in Bushwick and Middle Village in Queens for 10 full months while the MTA rebuilds two sections of deteriorating above-ground tracks. This July and August, during the first phase of repair work, there will be no trains between Myrtle Avenue and Middle Village. During that time M trains will be rerouted to Broadway Junction and all J, M and Z trains will be making local stops along that route. 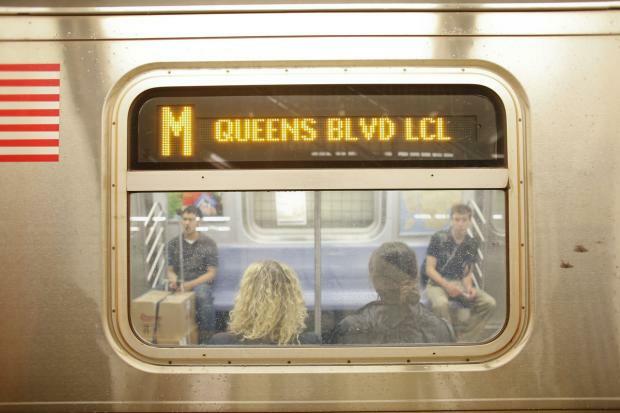 Instead the MTA will run free shuttle buses along three different routes 24 hours a day. One shuttle bus will run from Middle Village to the Jefferson Avenue L train stop and then to the Flushing Avenue J, M, Z train stop. Two other buses will run between Middle Village and Myrtle-Wyckoff and Myrtle-Wyckoff and Myrtle-Broadway. 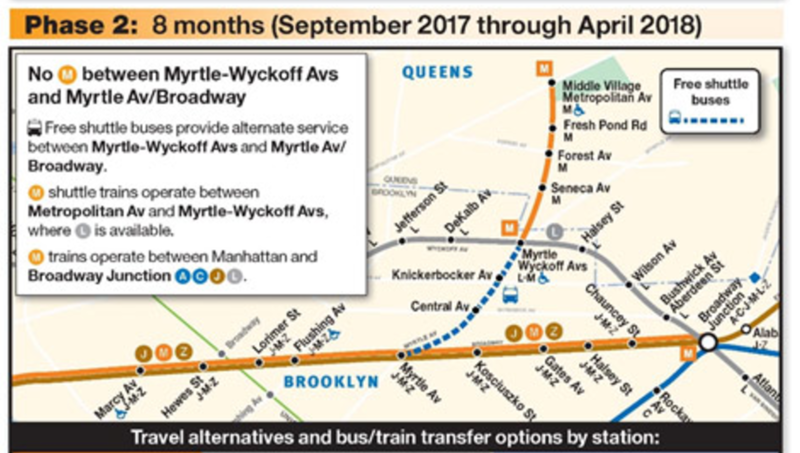 During the second phase of repair work which will last eight months from September to April of 2018, a section of the M train will reopen between Middle Village and Myrtle-Wyckoff and shuttle trains will run along it. Shuttle buses will connect Myrtle-Wyckoff with Myrtle-Broadway. The MTA has to tear down and repair two sections of tracks in advance of the 15-month L train shutdown, slated to begin in April of 2019. Several dozen residents of apartment buildings and homes around the Bushwick Cut, a concrete spur of the M train line that juts off of Broadway and links up to the tracks on Myrtle Avenue, will have to leave their homes for the 10-month period while the track is rebuilt. All homeowners will return after the repair work except one, who decided to sell their house to the MTA, officials said.